Pip Wilson bhp: Backintheday about a visit by the author to the first Youth & Community Centre that I managed back in late 60's early 70's. Backintheday about a visit by the author to the first Youth & Community Centre that I managed back in late 60's early 70's. 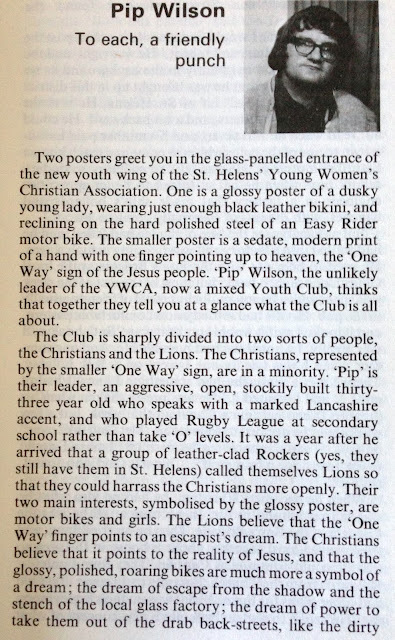 This is page one of a book published backintheday about a visit by the author to the first Youth & Community Centre that I managed back in late 60's early 70's. The YWCA Club, Nunn Street, Parr, St Helens. Yes that black and white image was me !